The growing investments and grants by governments worldwide for improving healthcare facilities and research and development in the field of medical devices are providing a fillip to the global endoscopy equipment market. In addition to this, the presence of favorable reimbursement policies in several countries across the world is stoking the growth of the overall market. The global endoscopy equipment market is likely to take a transformational leap forward with rapid technological advancements. Improvements in technology have paved way miniaturized and disposable endoscopes. Moreover, improving healthcare infrastructure in emerging countries and growing number of free-trade agreements are likely to offer tremendous growth opportunities for the endoscopy equipment market. Endoscopy devices are used in hospitals and clinics. The increasing number of hospitals along with the rising investments by hospitals in endoscopy units is stoking the growth of the market. Furthermore, the increasing collaborations and partnerships between hospitals and endoscopy equipment manufacturers are working in favor of the global market. Besides hospitals and clinics, these devices are being increasingly used across diagnostic laboratories and academic and research centers. The rising prevalence of diseases requiring endoscopy procedures has an inevitable positive impact on the growth of the global endoscopy equipment market. Players in the global endoscopy equipment market are focusing towards strategies such as mergers, acquisitions, and partnerships in order to consolidate their presence. These strategies also help companies in expanding their product portfolio and enhancing their technical expertise, which in turn helps in enhancing their visibility in the market. Endoscopy refers to the insertion of a long, thin tube into the body in order to observe tissues and other internal organs. Minor surgery and imagery are other functions carried out by endoscopy. Some of the most common endoscopy equipment are tubes, endoscopy display systems, endoscopy camera, endoscopy videoscope, lens system, eyepiece, and endoscopy irrigation pumps (used in urology). Because of its unique ability to target inaccessible areas within the human body, endoscopy is gradually becoming the primary method used in the detection of acute and chronic gastrointestinal disorders. One of the major trends observed in this market is the rising prominence of capsule endoscopy, wherein a pill-sized endoscopy device that captures images as it passes is consumed by the patient. 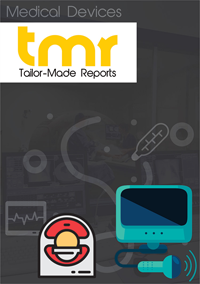 The report analyzes the key market trends, opportunities, growth drivers, and challenges faced by the global endoscopy equipment market. The key market players are studied in terms of their product portfolios, business strategies, market shares, and recent developments. Key aspects such as value chain analysis, technological advancements in the field of endoscopy equipment, market segmentation, and market size have been discussed along with authentic statistical findings. The high quality visualization offered by endoscopy devices enables physicians to detect, diagnose, and treat diseases accurately and efficiently. This is one of the key factors driving the growth of the global endoscopy equipment market. Increasing application areas such as gynecology and urology will boost the market for endoscopy equipment across the world. The emergence of single-incision surgery and robot-assisted surgery will also benefit growth. Recently, minimally-invasive surgeries have been widely accepted due to their advantages such as quicker recovery, shorter hospital stays, low blood loss, reduced trauma, and superior patient outcomes, contributing to the expansion of the market. Based on product type, visualization systems and endoscopes have been identified as key segments. Endoscopes can be further segmented into rigid, flexible, and capsules. On the basis of application, the global market for endoscopy equipment can include segments such as gastrointestinal endoscopy, hysteroscopy (endoscopy of uterus), colonoscopy, bronchoscopy, laparoscopy, otolaryngology, falloposcopy (endoscopy of fallopian tubes), and arthroscopy. Of these, the gastroscopy segment accounts for a considerable share in the market. Over the forecast period, the laparoscopy segment is also slated to gain prominence, fuelling the market for the endoscopy equipment. On the contrary, factors such as high costs of endoscopy procedures, strict regulatory policies, and lack of skilled personnel might emerge as the key challenges faced by the global endoscopy equipment market. North America is a prominent regional segment, followed by Europe and Asia Pacific. The U.S. holds a large chunk of the overall market for endoscopy equipment on account of high incidence of colorectal diseases, gastrointestinal disorders, and growing geriatric population. France, Germany, and the U.K. are the key countries responsible for the significant growth of the Europe endoscopy equipment market. Asia Pacific will grow at a substantial rate over the next few years, owing to the increasing awareness about minimally-invasive surgeries, popularity of medical tourism, growing healthcare expenditures, and emergence of numerous new endoscopic training centers. China, India, and Taiwan, in particular, will witness high level of expansion. Apart from these regions, the markets of Latin America, North Africa, and the Middle East are likely to display high demand for endoscopy equipment during 2017-2025. The leading companies operating in the global endoscopy equipment market include Stryker Corporation, Medtronic plc, Boston Scientific Corporation, Olympus Corporation, CONMED Corporation, Ethicon, Fujifilm Holdings Corporation, and Richard Wolf GmbH. Several leading companies have been focusing on R&D activities in order to come up with newer, competitive range of products.